§ 3B:12-1 Power of the court to order a protective arrangement. § 3B:12-2 Matters within a protective arrangement. § 3B:12-3 Factors to be considered before approving a protective arrangement. § 3B:12-4 Appointment of special guardian. § 3B:12-5 Right of alleged incapacitated person to trial on issue of incapacity. § 3B:12-6 Circumstances under which money may be paid or personal property delivered. 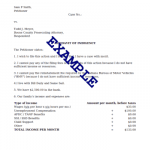 § 3B:12-11 Affidavit of receipt; contents; filing. § 3B:12-13 Power to designate testamentary guardian. § 3B:12-15 Appointment of testamentary guardian by surviving parent. § 3B:12-16 Bond of testamentary guardian. § 3B:12-24 Issue of incapacity triable without jury unless jury is demanded. § 3B:12-24.1 Determination by the court of need for guardianship services, specific services. § 3B:12-25 Appointment of guardian. § 3B:12-26 Action against incapacitated person when guardian newly appointed; leave of court required. § 3B:12-27 Distribution of property of an incapacitated person as intestate property. § 3B:12-28 Return to competency; restoration of estate. § 3B:12-30 Appointment of guardian of adult by parents or spouse or domestic partner; judgment confirming appointment. § 3B:12-31 Consent by surviving parent to guardian’s appointment. § 3B:12-33 Bond of testamentary guardian. § 3B:12-34 Determination into fitness of a testamentary guardian of the person of an incapacitated person. § 3B:12-35 Effect of a testamentary appointment. § 3B:12-36 Authority of court with respect to ward’s person and estate. § 3B:12-37 Letters of guardianship to state any limitations at the time of appointment or later. § 3B:12-38 Title to ward’s property vested in guardian as trustee. § 3B:12-39 Delegation of parent’s or guardian’s powers regarding ward’s care, custody or property; limitations. § 3B:12-41 Guardian of ward’s person entitled to reimbursement for expenses; payments to third persons. § 3B:12-42 Reporting condition of ward’s person and property to court. § 3B:12-43 Expenditures to be made by guardian out of ward’s estate. § 3B:12-44 Recommendations to be considered by guardian of ward’s estate in making expenditures. § 3B:12-45 Other factors to be considered by guardian of ward’s estate in making expenditures. § 3B:12-47 Persons to whom funds may be paid. § 3B:12-48 Powers conferred upon a guardian. § 3B:12-54 Duty of guardian to deliver property when minor attains 18 years of age. § 3B:12-56 Powers, rights and duties of a guardian of the person of a ward generally. § 3B:12-58 Gifts to charities and other objects. § 3B:12-59 Purchase of real property for use of an incapacitated person and his dependents. § 3B:12-61 Power of guardian to act as personal representative of the estate of a deceased incapacitated person. § 3B:12-64 When authority and responsibility of guardian terminate. § 3B:12-66.1 Removal from New Jersey after appointment of guardian. § 3B:12-66.2 Transfer into New Jersey of guardianship established in another state.